If you’re going to own a handgun, you need to be proficient with it. You have to know how to safely operate it, including mastering (not just learning) the ability to draw, shoot, clear malfunctions, and disassemble and reassemble it. If you decide to exercise your 2nd Amendment rights the way the Founding Fathers intended by carrying concealed, you need to train even harder – the stakes get higher, the danger gets more real, and the margin of error becomes nil. Safety won’t mean just exercising good trigger discipline at the range, it’ll mean knowing how to react to a threat quickly and with confidence. These will be life-or-death decisions that you alone must make. Quickly. With that in mind, practice, practice, and more practice is key. Training and shooting at the range with the intent of carrying concealed (and potentially killing another human being who is deemed a lethal threat) means conducting a helluva lot more drills and exercises than just learning how to get shots on paper. Police train for hundreds of hours just so they can safely and confidently make that microsecond decision to draw and shoot. Your training should, under the best circumstances, be no different. You’re accepting that same risk and responsibility, and you don’t have the official title of “law enforcement officer” to support your training if that fateful fatal moment comes. When you put on that holster, you’re accepting the possibility that you will have to shoot to kill. A handgun cannot be discounted as a simple deterrent. With that possibility, keep reading to learn four of the most valuable shooting drills and training exercises that’ll help you accept that concealed carry responsibility with confidence. a. Isosceles: The Isosceles stance is the “original” shooter’s stance. To assume this stance, square off with your target so you’re facing it directly from head to toe. Spread your feet apart so they line up with your shoulder width. Your feet should be pointing at the target ahead. Bend your knees just slightly – around 20 to 30 degrees. Raise your handgun with both arms extended fully, and lean in to the target just slightly. Your body will form the angles of an isosceles triangle (hence the name). b. Weaver: The Weaver stance is a popular replacement to the Isosceles stance. It can be considered a more natural stance under stressful conditions. To assume the Weaver stance, place your dominant foot on the firing line and point it toward the target. Place your non-dominant foot further back, as though you’re about to lean against a door or push a large object. Distribute your weight evenly on both feet. Your body should naturally face an angle that’s slightly off from the target. Use your shooting hand and “push” your handgun toward the target with your shooting arm extended. Use your non-dominant or supporting hand to “pull” your handgun with your non-shooting arm bent down, providing balance and stability. Both of these shooting stances will allow your body to remain stable when firing. Your arms will be able to absorb recoil while keeping your handgun trained on your target for quick follow-up shots. Leaning into your target helps to further stabilize your shots and mitigate recoil. If the time comes to draw in response to a threat, you likely won’t be considering whether your foot placement and torso angle are optimal. But practicing a natural, stable stance will eventually turn into muscle memory, and while your stance may not be “range-perfect”, it’ll still ensure you’re planted, ready to fire, and ready to follow up with quick shots. Sight picture refers to how you’ll focus your eyes and see your target. There are three common methods of obtaining sight picture – but only one is correct. The most common mistake new shooters make is focusing on the target itself, or the rear sight. Focusing on the target itself blurs your front and rear sights and makes for poor shot groups. Focusing on the rear sights causes your target to blur too much, and your shot groups will again suffer. The proper way to obtain a great sight picture to focus on your front sight. The top of your rear sight’s fins should line up vertically and horizontally with your front sight post, and both should then line up with the center mass of your target. Never aim high or low, and never attempt to compensate for your target’s distance. When carrying concealed, you’ll likely never take a shot beyond 50 meters, and distance should never factor into your sight picture or shot placement. Although you may be flushed with adrenaline during a threat situation, steady breathing is critical in making good, effective shot placements. Ideally, shots should be taken at the highest point of your inhalation, just before you exhale. Shooting at the apex of your breath is easily repeatable because you generally take similar breathes every time, and the intake of fresh oxygen gives you critical microseconds to get a steady sight picture without feeling light headed, getting a blurry sight picture, or suffering tunnel vision. As humans, we naturally take that “one last deep breath” before submitting to a dangerous or exciting action, so this method of breathing and shooting is natural and intuitive. Trigger squeeze should be fast but smooth. Your trigger finger should be placed on the trigger half way between your finger’s first bend, and the tip of your finger. Going too far in or out with your trigger finger will pull shots off your target, which will kill your shot placement and make for poor accuracy. Your trigger should be viewed as a lever, not a button. You should make the attempt to “pull the lever” with consistent pressure and speed until your weapon fires. This will help ensure repeatability and tighter shot groups. For handguns, a good grip is just as important as the Army’s Four Fundamentals of Marksmanship. 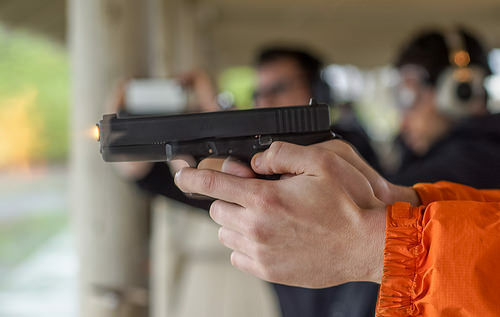 Getting a good grip requires a few considerations: Your forearm should line up directly behind your handgun, so that recoil is absorbed straight back and your handgun isn’t “pulling away” with every shot. Your handgun should be seated directly in the deepest part of the web of your shooting hand, between your index finger and your thumb’s knuckle. All other fingers should be wrapped securely around the grip. 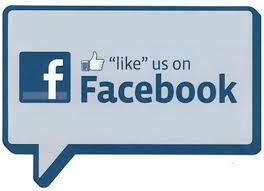 Your thumb should be extended and flat against the side of your handgun. Your other hand should cup your shooting hand underneath the barrel. Your non-shooting hand’s fingers should wrap around the fingers of your shooting hand, and your non-shooting thumb should rest flat and extended, just behind the knuckle of your shooting thumb. Your hands should be as high up on your handgun as possible, without risking “slide bite”. This occurs when you fire, and your handgun’s slide runs against the top of your hands or thumbs, causing cuts and blisters. This grip is known as the straight-thumbs grip. It’s the standard for professional shooters, it’s ergonomic, and it’s quick and natural. We like to keep it simple, so we strongly recommend this grip. You should practice these Fundamentals of Marksmanship as often as possible. Weekly range sessions are best. These fundamentals should become second nature. Mastering them – not just knowing them – will instill confidence in a threat situation. Once you’ve began placing shots center mass of your target with tight groups, you’ll know you’re making progress. 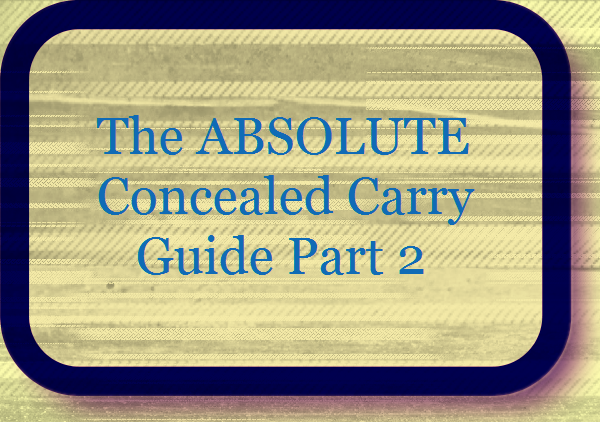 When you can punch out the center of your target with enough rounds to see through to the other side in less than 30 seconds and using only one magazine, you’ll know you’re beginning to get confident enough for concealed carry situations. No firearm is perfect and malfunctions can happen, even to the best of them. Knowing what to do when a malfunction happens is so important when life and death are competing. This exercise is repeatable and easy to conduct with live rounds at the range or dry fires at home. To start, rack your slide and get into your shooting stance. Get a good sight picture and pull the trigger. As always, point at a target or a safe direction. Now imagine a malfunction has occurred, be it an empty chamber (a failure to feed) or a stove pipe jam. Keeping your handgun trained on the target as closely as possible, quickly smack the bottom of your magazine with your non-shooting hand. Pull your slide back fully and let it slam forward. Regain your grip and sight picture and shoot again. Continue this drill as often as needed until you’re confident you can do so intuitively and quickly. You’ll know you’ve mastered clearing malfunctions when one happens at the range and you instinctively clear it without hesitation. This sounds like an obvious drill, because it is. Yet unfortunately, many professional CCL training classes and instructors avoid this basic task – usually because of insurance liabilities or risk. Beyond mastering The Fundamentals and clearing malfunctions, learning to safely and quickly draw from concealment during a threat is the most important skill to learn. Practicing drawing from concealment is pretty self-explanatory: Carry your weapon in your holster of choice, wear the clothing you would normally wear, and do not modify your behavior, gait, or demeanor in any way. Act natural. Ensure your handgun is truly concealed and isn’t “printing” or showing, just as it shouldn’t be when you’re out and about. Once comfortable, simulate a threat. It’s best to have a helper with you who can announce “Threat!” so you’re reacting without preparation or knowing when it’ll come. Draw your weapon and assume your shooting stance (at your target or in a safe direction, of course). Evaluate your draw speed, grip and shooting stance – again, it’s best to have a helper who can assess with you. During this exercise you may find your holster does not work well. You may realize it simply doesn’t gel with its placement on your body, or that it just doesn’t work with your clothing, your handgun of choice, your movement, or your environment. 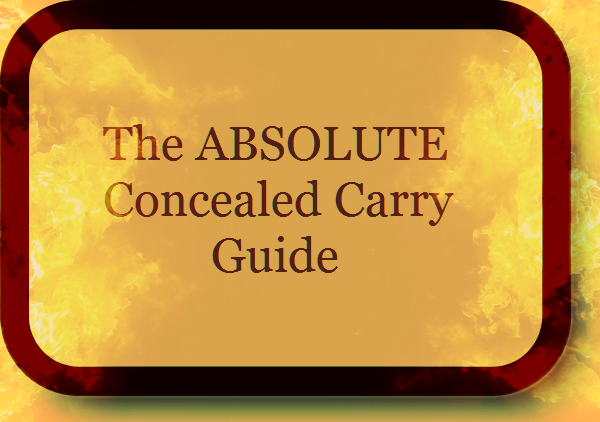 This is a critical training exercise that will ensure your holster or concealment method is proven to be effective and intuitive. Our first three drills and training exercises focus on the concepts of effective shooting, operating your weapon, and drawing. This final, critical drill tests your mettle in the most likely threat scenario. The FBI has found that 70% of all lethal encounters – be it a thief with a knife, an active shooter, or any other threat – occur at night or dusk, last just 3 to 5 seconds, occur at 5 to 6 feet, and end with 6 to 8 rounds fired. So, what does that all mean for your training? That means you have to train to shoot at close range. You have to consider that you may not be able to get into a shooting stance and you will have to shoot quickly, emptying plenty of rounds in just a few seconds. We can’t make it any simpler: This is where you’ll train to kill or be killed. Training to react to these “most likely” conditions means performing a specific set of actions. Load your magazine with 6 rounds to mimic the average rounds used in a lethal encounter. It’s always better to train for the worst-case scenario (fewer rounds available and/or used) than to train for the best-case scenario (a full magazine). Although the FBI states lethal encounters occur at 5 to 6 feet, it’s recommended to train at 7 to 10 yards from your target. Shooting at this distance requires more accuracy while still simulating the need for a quick draw to stop a rapidly advancing threat. At this distance you’ll be able to see the results of your hasty stance and whether your shot placement is acceptably accurate. The goal of this exercise is to get all shots on target in 3 to 5 seconds, from initial draw to the 6th trigger pull, with both a single-handed grip and no shooting stance, and a traditional two-handed grip and shooting stance. This exercise is fast and requires complete concentration, so it is highly recommended to have a helper spot your stance and time your speed for you. When you can repeatedly draw and place all your shots on your target in the allotted time with a single- and double-handed grip, stance and no stance, you’ll know you’ve begun to master this exercise. There’s a ton of info in here, and it shouldn’t be glazed over. Take each exercise one at a time. Master each one before moving onto the next. Don’t just train for one and then leave it behind. Build each exercise into the next. These drills are designed to compound. Once you’ve mastered the Five Fundamentals, master how to clear malfunctions. Master how to draw quickly and safely and then once you’ve drawn, go through the first two drills immediately. Reinforce The Fundamentals and clear a jam or malfunction half way. Once you’ve combined these three exercises confidently, test all of them in your fourth and final drill. These things take time, but they will save your life. Never stop practicing. For as long as you carry, you should exercise these drills. Over, and over, and over, and over… With that in mind, good luck.